OBJECTIVE: Natural orifice translumenal endoscopic surgery (NOTES) is still a new and investigative technique. To date, published short-term outcomes have been promising. Little is known about the long term effects of novel access routes for standard surgeries. 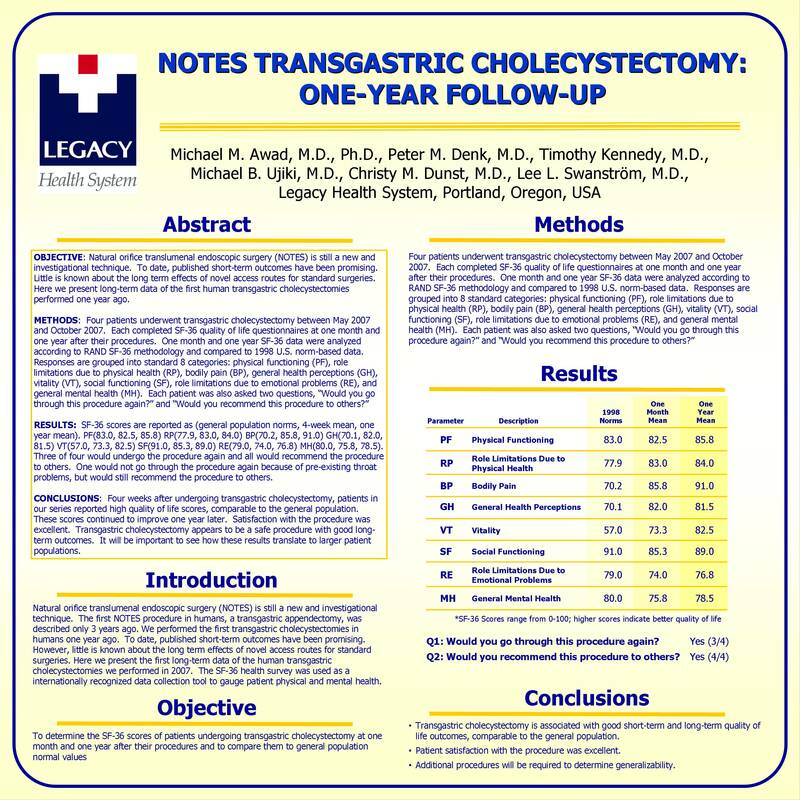 Here we present long-term data of the first human transgastric cholecystectomies performed one year ago. RESULTS: SF-36 scores are reported as (general population norms, 4-week mean, one year mean). PF(83.0, 82.5, 85.8) RP(77.9, 83.0, 84.0) BP(70.2, 85.8, 91.0) GH(70.1, 82.0, 81.5) VT(57.0, 73.3, 82.5) SF(91.0, 85.3, 89.0) RE(79.0, 74.0, 76.8) MH(80.0, 75.8, 78.5). Three of four would undergo the procedure again and all would recommend the procedure to others. One would not go through the procedure again because of pre-existing throat problems, but would still recommend the procedure to others. CONCLUSIONS: Four weeks after undergoing transgastric cholecystectomy, patients in our series reported high quality of life scores, comparable to the general population. These scores continued to improve one year later. Satisfaction with the procedure was excellent. Transgastric cholecystectomy appears to be a safe procedure with good long-term outcomes. It will be important to see how these results translate to larger patient populations.